Riya turns marketing Professor – CachedIdeas – Ideas on the Go! Walked in to our lift yesterday evening and I saw this familiar handwriting. 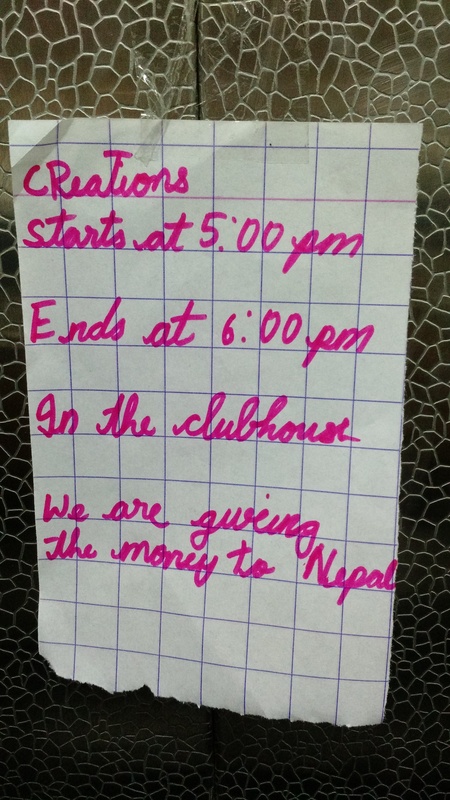 The message was from my 6 year old who was confronted between buying a new keyboard and helping Nepal victims from the proceeds of her pop up stall in our community. – She understood her audience and figured out this low cost high impact medium. – For an apartment complex with 8 floors, she choose lift over the notice board for high visibility. – Built a sense of urgency by listing out a short time span to react (of course she played it smart by not mentioning the date). – She picked a cause that has an immediate emotional connect. – The best, by just saying ‘Creations’ she is totally playing on the curiosity to ensure there are enough and more footfalls. Side Note: The sale is on and I am not sure how much she’s made out of it, but she definitely won loads of hearts and her new keyboard as a special gift from her Dad.